I spent part of the weekend reading about creation myths and fables of the Chokwe, an ethnic group that lives roughly in Angola. This is part of my research for the new book, which is expanding to have an extensive “Ethno-mathematics” section (i.e. Math and Fractal Drawings from around the world), specifically the Chokwe tradition of Sona. Sona are drawings made in the sand while telling a story or riddle. It’s one of the ways in which Chokwe elders impart knowledge and fables, though from what I’m reading the Sona tradition is dying out. 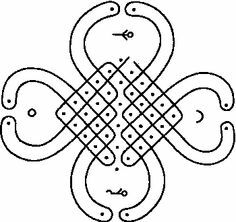 They bear a resemblance to the Kolam of the Tamil-Nadu community in India, and even to traditional Celtic knots. Math from other cultures is becoming really intriguing to me, and it’s an area I don’t think is covered enough in public education. Colonial era westerners often made the assumption that these “primitive” peoples didn’t understand some of the higher concepts of technology and mathematics, but if my studies have taught me anything it’s that we westerners were a little behind the curve (so to speak). At the very least, learning about how other cultures look at math and art can help us to see connections between ideas from new perspectives. But one of the things I am wondering about is how to tell these stories respectfully. Some fables and tales are very private, specific to a culture, and not something that is intended to be shared with outsiders. Now obviously, since I don’t have the resources to travel to Angola myself, I’m getting these stories from people who’ve already spread them around. The genie is out of the bottle, so to speak. But it’s still important to consider their meaning, rather than to just include them as a pretty picture. A lot of Adult Coloring Books have mandalas, in fact mandalas seem to be the stand-in term for most circular patterns in coloring books. I don’t think there’s anything wrong with enjoying these patterns, or designing new ones, and coloring them as a loose form of meditation. But at the same time I think it is also important to be respectful and understanding of the tradition. We want to learn and educate ourselves about a type of drawing, not just appropriate it. Sometimes meanings for things change. The Kolam tradition seems to have had religious significance in the past, but now it is more a form of artistic expression by women in the Tamil community. Celtic knot constructions have a triune grid which reflects the triune nature of God, but also look really good on leather bound notebooks. I’m a guy who wants to spread art and cool designs for their own sake, while also trying to explore some of the deeper meaning these traditions have to the cultures that created them. And I want to do that in a way that honors those traditions, without sharing them merely because they are exotic or different. The best way, at least for me, is showing the connections between some of the more abstract concepts of fractals, and their origins before they really came into their own (the days of computers and Mandelbrot). I’ve been thinking about fractals as something that is a new concept in math, but their origins may be much older. I’m still working this stuff out, but I hope my intentions if nothing else can shape the writing in a good direction.